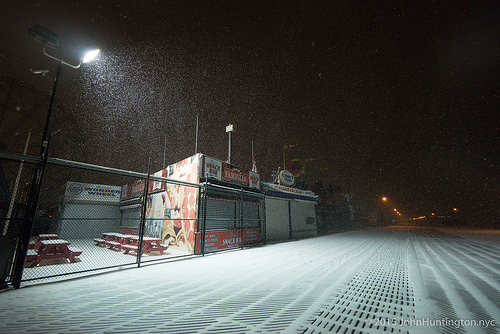 For the first snow of past winters, ATZ has posted Bruce Handy’s exquisite photos of snow mermaids and the pattern of snow on the slats of the wooden boardwalk. Saturday’s snow was a blizzard of 26.8 inches, making it the city’s second largest snowstorm since 1869. It’s no wonder this year’s photos are less contemplative and more action-oriented. After weeks of balmy weather, several members of the Coney Island Polar Bear Club gathered for a frolic on the snowy beach and a blizzard dip amid crashing waves and gusty winds. Want to go for a day after the blizzard swim with the Polar Bears on Sunday? You’re welcome to join as a guest. Just show up at the Bears’ “Clubhouse” at the Aquarium’s Education Hall on the Boardwalk at West 8th Street by 12:30 pm with your bathing suit, a towel, surf boots or an extra pair of sneakers, and some warm clothing. 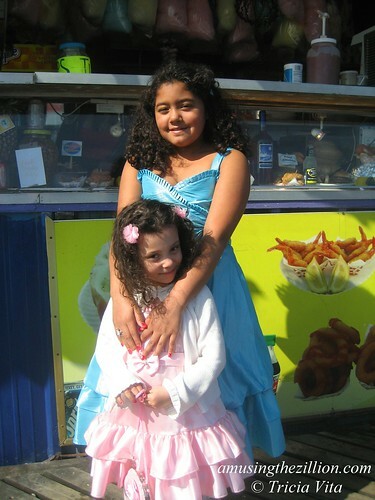 Happy Easter and Happy Passover from Coney Island! 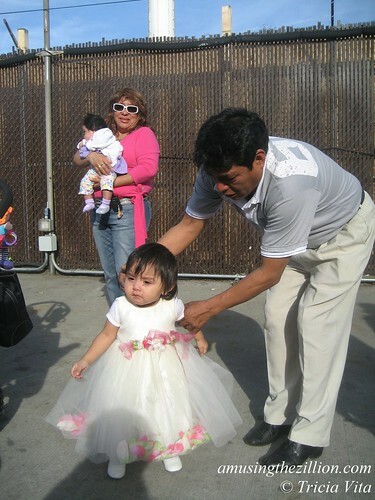 While Palm Sunday is Coney Island’s season opener, it’s Easter that draws the crowds. If the weather is favorable, as we expect this Sunday–“Mostly sunny and breezy. Highs in the upper 50s,” according to the National Weather Service–the day can be as busy for the amusement ride and game operators as the Fourth of July. In 2010, Easter was on April 4th and temps were in the 70s when we snapped these photos of New Yorkers in their Sunday best. 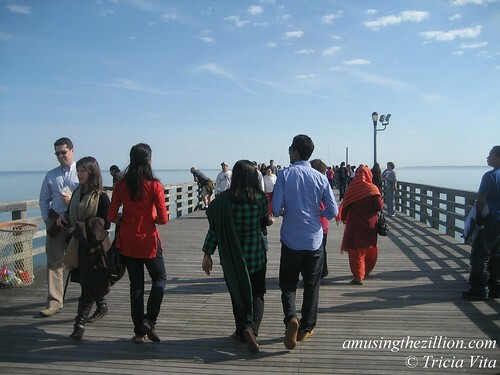 The Boardwalk was a People’s Parade on Easter Sunday. Lines were long at ticket booths and rides were jam packed from noon till nearly midnight! 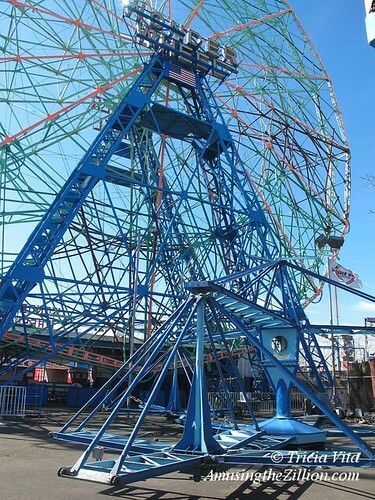 While the kids are off from New York City schools through April 12, Deno’s Wonder Wheel Park and Luna Park are open daily for Spring Break, weather permitting. The parks open at 12 noon. Coney Island’s roller coasters–the Cyclone and the Thunderbolt– will be up and running this weekend. Deno’s Wonder Wheel Park has four new family rides, including a Mangels’ Whip inspired Speedway and the retro Scrambler. Keep an eye out for “Easter fresh” outfits, including bunny headgear! 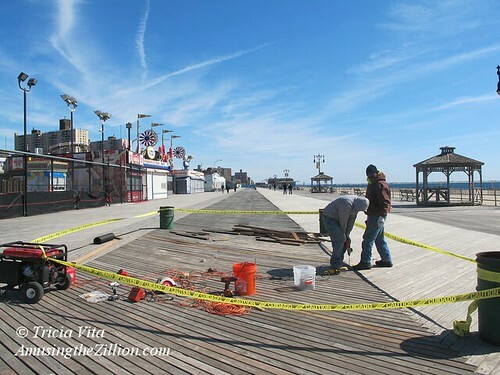 With Coney Island’s Palm Sunday season opener a mere 10 days away, the amusement area is a flurry of activity. New signage and work permits are affixed to buildings, job trainings and Boardwalk repairs are underway. Trenches are being dug along the Bowery and Jones Walk to lay new gas lines before the area comes fully awake from its winter slumber. 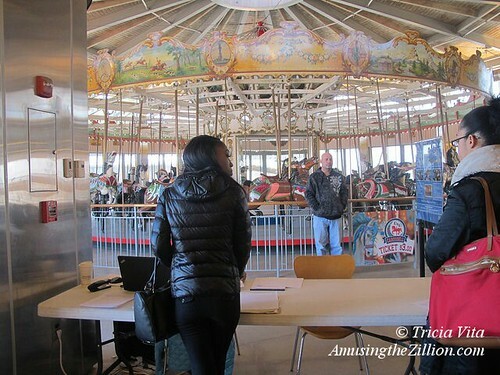 City ride inspectors were on site on Wednesday inspecting rides that are ready to spin while both new rides and old favorites are still being set up in Coney Island’s amusement parks. 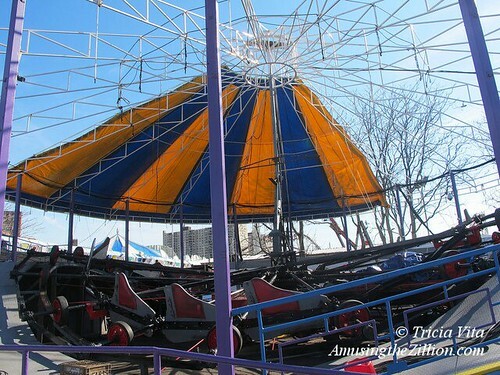 Astroland’s popular Scrambler has been refurbished and brought home to Coney Island. The ride is now being assembled in its new spot beside the Wonder Wheel. In Luna Park, Zamperla’s Rockin’ Tug has replaced the Beach Shack, and more new rides are yet to come. 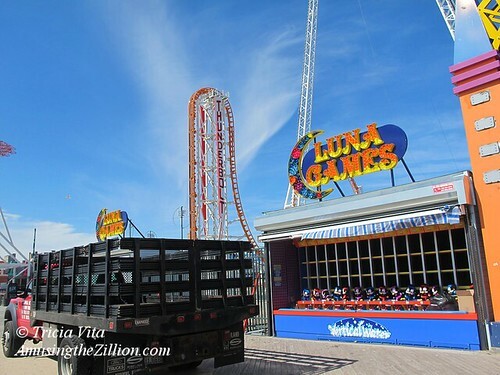 Luna Park is increasing its presence on the Boardwalk with bold electric signage for “Luna Games” and additional pinwheels, which are the park’s logo. ATZ has learned exclusively that the owner of Coney’s Cones sold his small business to landlord Central Amusements International, which operates Luna Park. The ice cream shop had one year remaining on its five-year lease. The other independent businesses on the Boardwalk including Tom’s, Ruby’s and Paul’s Daughter have eight-year leases. 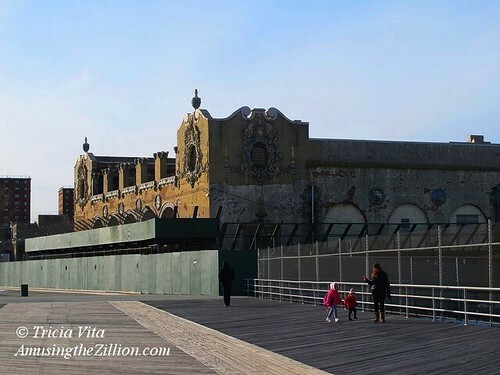 Sources say that Zamperla will bring an Italian gelato shop to Coney Cone’s location, which is adjacent to the park’s boardwalk gate. The park is also debuting ticketbooths on the Boardwalk. 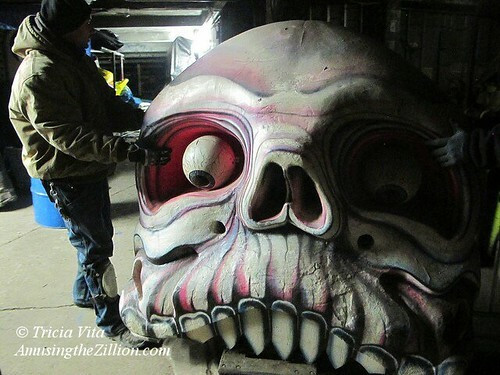 In the Strange & Unusual Department: A giant skull long retired from duty at Wonder Wheel Park’s Spook-A-Rama dark ride was pulled out of storage and wheeled over to the Coney Island History Project. This fantastic creature will be on display this season, replacing the Cyclops head which is on loan to the Wadsworth Atheneum Museum of Art for a traveling art exhibit. Like the Cyclops, the skull’s eyes light up and move, promising some terrific selfies. The skull was a stage prop in Harvey Fierstein’s 1984 play Spookhouse and a denizen of the Coney Island Hysterical Society’s Spookhouse in the former Dragon’s Cave on the Bowery. 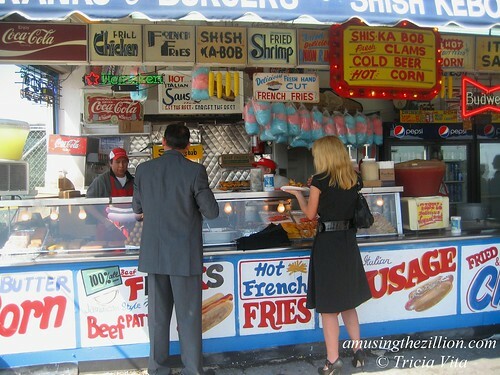 Check our post on “Coney Island Amusement Park Jobs from Entry Level to Managerial Up for Grabs” for updates. New jobs being advertised included Brand Ambassadors for Luna Park, Marketing and Events Coordinator for Wahlburgers, and account Manager for Coney Island Brewing Company. Game of skill operators are needed for the 2015 season at the independent games on West 12th street off the Boardwalk. Apply in person or message @MissConeyIsland via twitter. 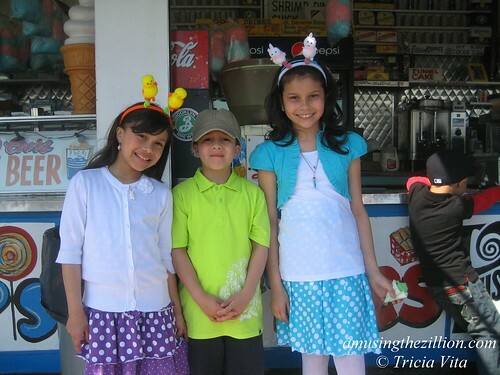 After the March 29th season opener, Coney Island’s amusement parks are open weekends and school holidays until the daily schedule kicks in Memorial Day Weekend. More photos from this set may be viewed on flickr. Never mind the snow, it’s only two weeks till spring! 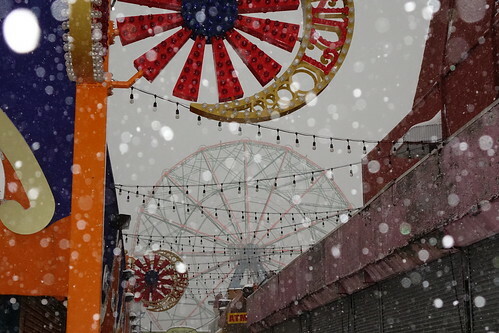 This week in Coney Island, the Boardwalk was alternately icy and snowy, and the majority of businesses in the amusement area were shut tight, but glimpses of spring could be seen. 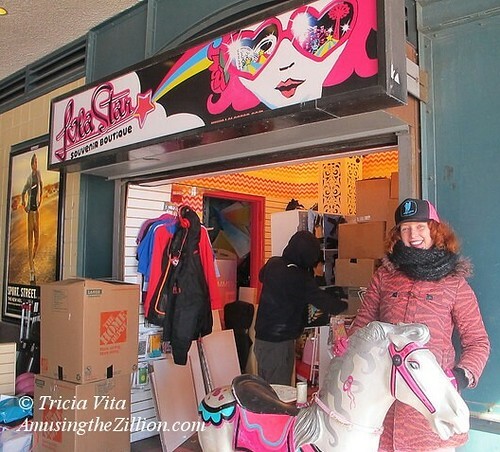 In Stillwell Terminal, Dianna Carlin was moving back into her Lola Star Boutique after spending the winter at a pop up shop in Williamsburg. Her second store is on the Boardwalk. 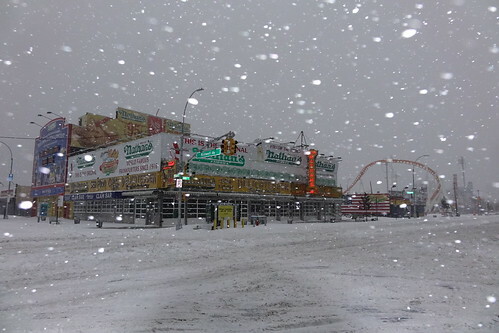 Coney Island’s Opening Day is just a few weeks away on March 29 because Palm Sunday is early this year. 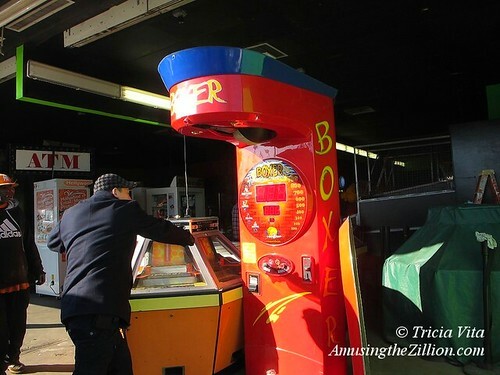 The front of the Eldorado Arcade was open as workers readied the arcade machines for the first event of the new season–DJ Nicky Siano’s 60th birthday party on March 20. Siano, who was a resident DJ at Studio 54, was drawn to Coney Island by the Eldorado Auto Skooter’s legendary sound system built by Richard Long of the Paradise Garage and Studio 54. “We will be dancing on the floor (not riding),” say party organizers, who are selling advance tickets online for $25. The arcade will be operating and Nicky will be spinning all night. 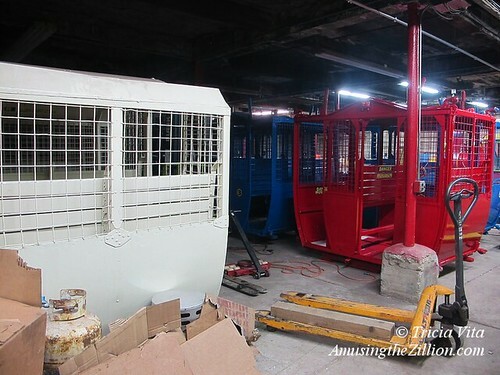 At Deno’s Wonder Wheel Park, the new Whip-inspired Speedway ride was being assembled while the freshly painted Wonder Wheel cars were lined up inside the shop. 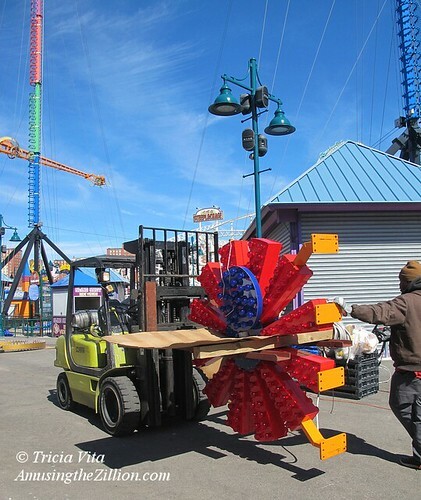 Spring officially arrives in Coney Island when the cars are put back up on the Wheel. As we’ve noted before, being here to see the 24 cars go up, the Swinging ones first and then the Stationary, is like seeing red, white and blue crocuses bloom before your eyes. The date the cars go up is subject to the vagaries of wind, weather and work schedules, but it’s usually a week or so before Opening Day. 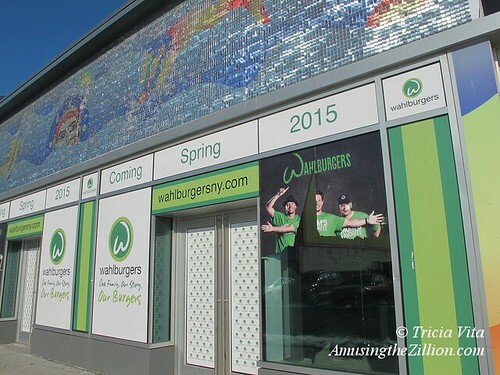 The green sign on Thor Equities’ Stillwell Avenue storefront across from Nathan’s says “Coming Spring 2015 – Wahlburgers – Our Family – Our Story – Our Burgers.” Coney Island is getting a concentration of new franchises, including IHOP, Checkers and Subway Cafe, that threaten to turn Surf Avenue into Anytown USA. Wahlburgers has a niche of its own. It will bring the celebrity brothers Donnie, Mark and Paul Wahlberg to Coney Island to film the restaurant’s opening for their A&E reality show. When ATZ first reported the news last year of Wahlburgers coming to Coney, the post was nearly as popular as Friday night fireworks! 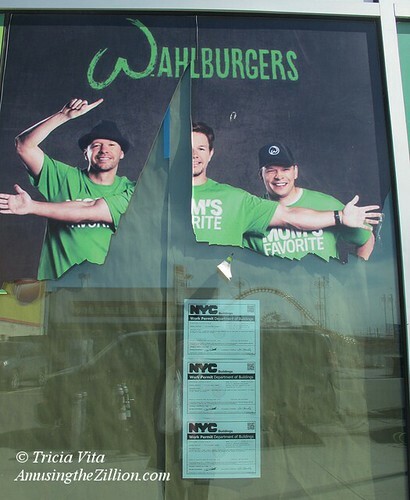 The restaurant will be the first of seven Wahlburgers franchises slated to open in New York City. Construction is underway with a May 1st opening date announced. 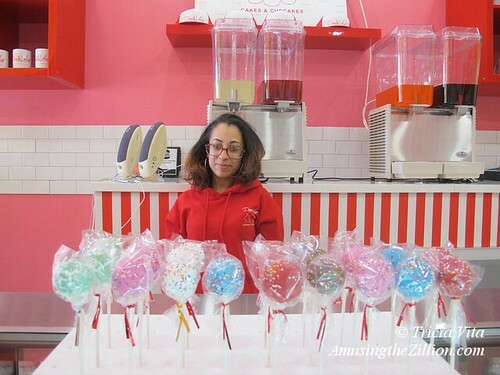 An outpost of Piece of Velvet, a cake and cupcake shop with locations in Fort Greene and Harlem, opened in Coney Island on Valentine’s Day. Owned by a “staff collective” of former Cake Man Raven employees, tThe store is located on the north side of Surf across the street from Nathan’s and Williams Candy. Red velvet cakes and cupcakes are their specialty and are delicious. Check for introductory specials on Groupon. 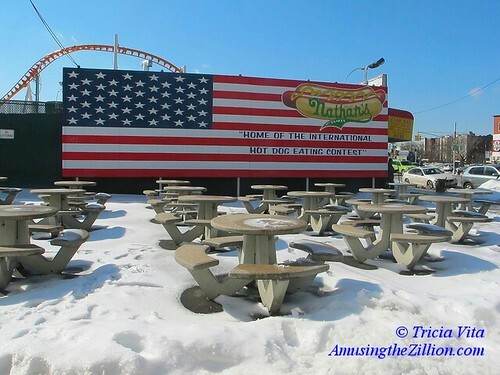 While Nathan’s outdoor dining area is still covered in snow, plenty of indoor seating is available during the off-season. Last weekend, one of the first qualifiers for the July 4th Hot Dog Eating Contest was held at the Florida Strawberry Festival. The winning contestants were Nasty Nate Biller of Texas, who downed 23 dogs in 10 minutes, and Mary Bowers of California, with 10. 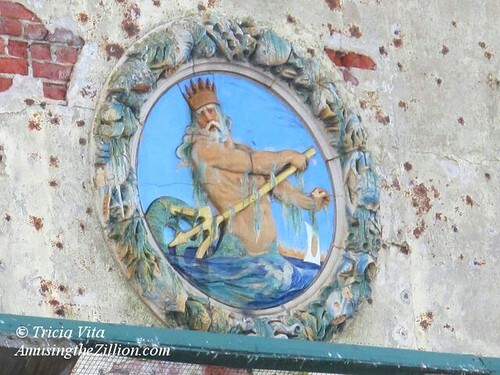 Tourists often ask “what are those ruins on the Boardwalk?” Some locals tell them the crumbling palazzo by the sea is an old bathhouse. The former Childs Restaurant building has been been vacant for so long, between stints as a chocolate factory, a roller rink, and a warehouse, most people have no memory of its glory days. Last weekend, ATZ took these photos of the 1923 landmark, which is now in hibernation, awaiting restoration as part of a $53 million dollar City project. Terra-cotta fish and seashells and Neptune the god of the sea peek out from above the sidewalk shed and plywood fencing, which was recently installed around the property. The construction of the shed and fencing and work on the floors are the only permits currently approved by the Department of Buildings. 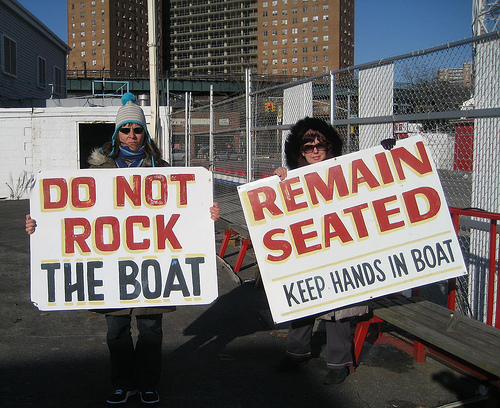 Several other permits are still listed as on hold pending the outcome of a lawsuit by the New York City Community Garden Coalition (NYCCGC) and the Coney Island Boardwalk Community Garden members vs the City and developer iStar Financial. The clerk for Judge Peter Sweeney, who got the case after a prior judge recused himself, told ATZ last week that the judge has not yet made a decision. At a hearing in December, Judge Sweeney asked both sides to submit briefs arguing for or against a jury trial. The crux of the suit is the gardeners’ claim the land is public parkland and that the development project is an alienation of parkland without the required approval of the state legislature. In December 2013, the garden was razed without warning to make way for construction of the seating area for the amphitheater, which was initially expected to open in June 2015. 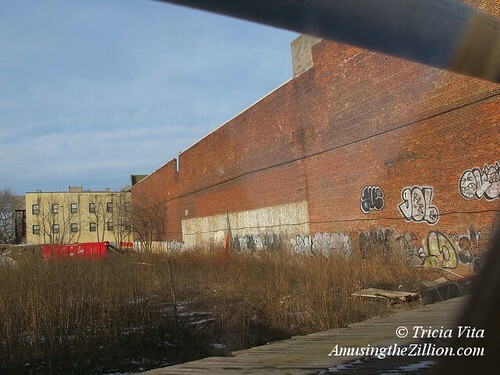 ATZ previously wrote about the project when it was under consideration (Clock Ticking on Plan for the Landmark Childs Building, September 25, 2013) and after the razing of the garden (Pre-Dawn Bulldozing of Coney Island Community Garden, December 29, 2013). What is going on here? The Boardwalk Community Garden lawsuit is on its third judge with no end in sight! On Monday morn, NYCCGC in court again vs the City and iStar. I expected my Jan 28th visit to Astroland to be my last visit (see set). But I had some business in the area so I stopped by Astroland on Jan 31. By then there wasn’t much left and I didn’t have the heart to take more than a half dozen or so photos. Jan 31 was Astroland’s very last day, the day the lease expired and the property had to be vacated. On Feb 1, 2009, the Astroland property became the former site of Astroland Park. Since then I refer to it as Thorland after Thor Equities. Others call it Sittville or Sittland East after Thor CEO Joe Sitt. The predatory real estate speculator who owns the 3-acre site is pressuring the city to allow for time-share high rises and shopping mall style retail. Astroland, and now the Boardwalk businesses threatened by huge Thor Space for Lease signs, are pawns or hostages in Thor’s high stakes game with the City. The City’s controversial rezoning of the C-7 amusement district is currently underway. Among the items that remained and were about to be thrown into a dumpster were these broken old arcade machines. 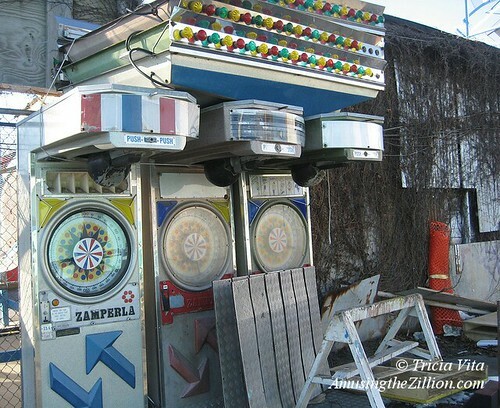 Boxing machines manufactured by Zamperla! Ironically, the parks division of Zamperla would build Luna Park on the former Astroland site in 2010, after this lot and other boardwalk property was bought by the City from Thor Equities for $95.6 million. 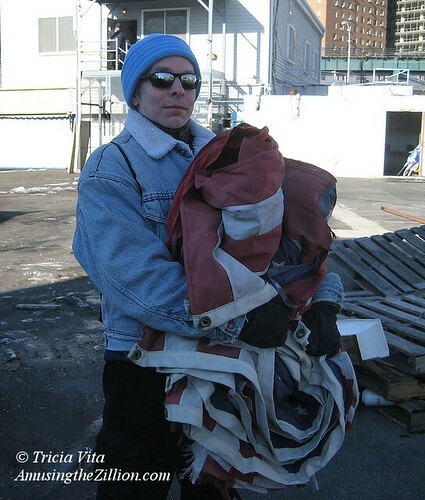 Jeff rescues Astroland’s American flag, which flew from the Astrotower, from soon to be Thorland. Astroland’s signs and rides are safe in storage. NOT sold to Australia or anywhere else, not yet! Perhaps the reconfigured “Astroland,” signs and all, will be able to return to a new location or its old location (if Sitt sells to the city) in Coney Island? That would be a “long shot” (Astroland owner’s words in the press). But I don’t think we should give up hope completely if the owner still has hope. 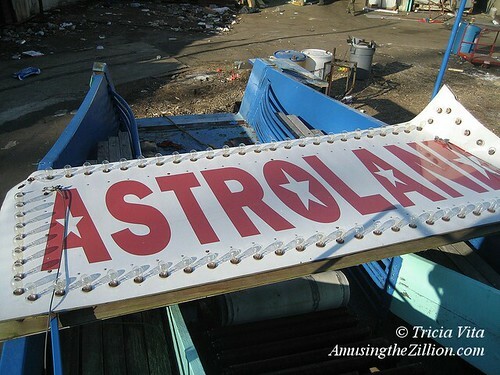 Some of Astroland’s historic signs were rescued today by the Coney Island History Project. Home of the hot dog? This building has been used as a workshop for the last forty-some years. Astroland workers swept up for the last time on Jan 31, 2009 before vacating the property. 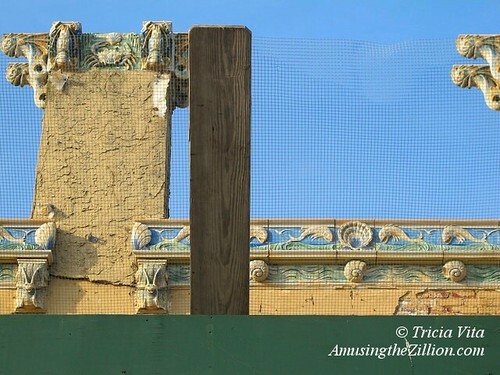 I took these photos for my friend “Coney Islander.” who says the tiles are not only Coney Island history, but American history too. He wanted a tile as a keepsake, but we couldn’t find a loose one. Of course “the first hot dog” was invented when Feltman was pushing a pie wagon in the 1860s. 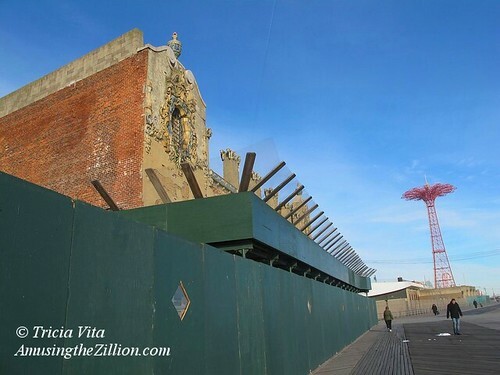 But the building is all that remains of Feltman’s empire in Coney Island. 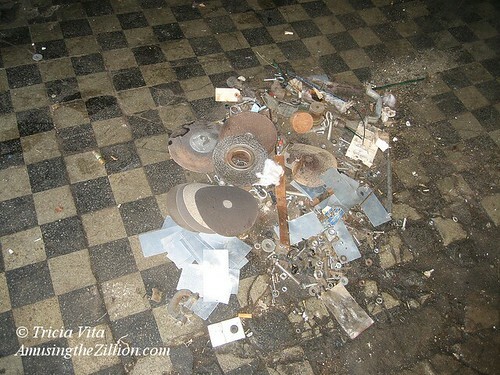 The floor definitely has character. It has a story to tell. We just have to figure out what it is. Sometimes if the true story isn’t known, an apochryphal one fills the vacuum. 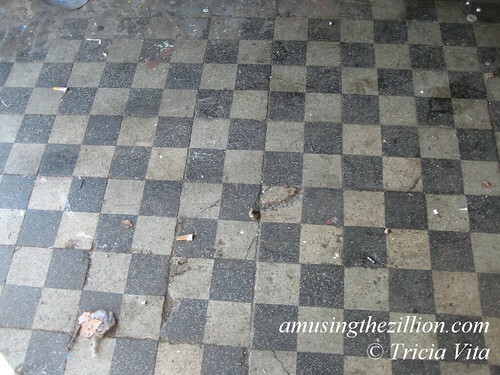 The floor looks so old it’s easy to imagine the original hot dog falling on it. It may be doubtful as history goes, but captures the imagination. 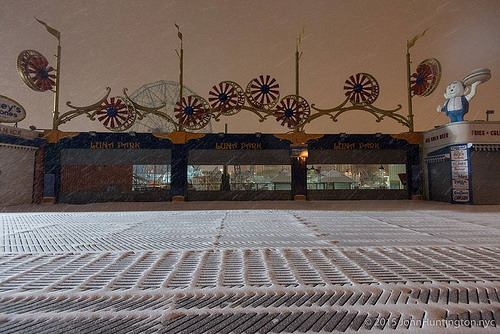 When Brooklyn photographer John Huntington took the subway to Coney Island at the start of the “Blizzard of 2015,” it was just before dusk and he had a subway car all to himself. 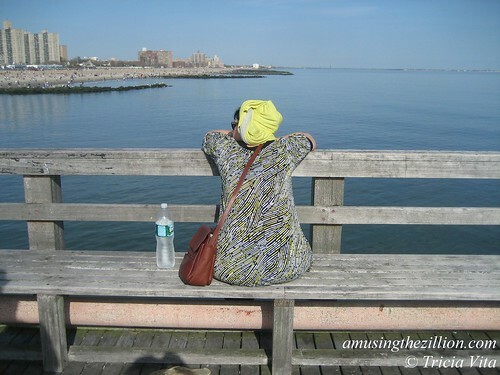 He saw a few people heading home along Surf Avenue and a solitary figure seated on a bench looking out at the ocean. On the boardwalk, the patterns of freshly fallen snow on the slats are a lovely sight to see and to photograph, and one that will soon disappear if the Parks Department is allowed to continue replacing the wooden boards with concrete and plastic. 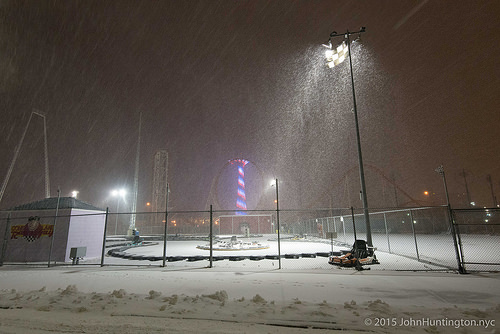 The hibernating amusement parks and attractions provide a colorful backdrop for this storm chaser’s photos. “Storm chasing requires knowledge of weather, mobility, and patience. I shoot any storm I can here in New York City, and in the spring I often chase across the great plains and beyond,” says the intro to a page with storm photos on Huntington’s blog. Among his photos are images of tornadoes in Kansas and Texas, and Coney Island and the Jersey Shore after Hurricane Sandy. “I’ve been chasing probably since the 80’s–my first chase was Hurricane Gloria,” Huntington told ATZ. 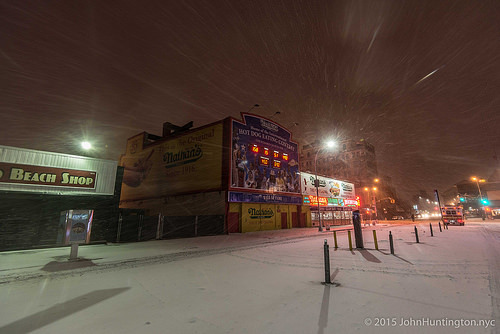 The photographer hoped to go back to Coney on Tuesday. “I won’t be able to get out there tomorrow with no subway. This is apparently the first time they EVER shut the trains down for a snow storm,” he said. According to a popular post last night on the blog Second Avenue Sagas, the closing of the subway for a blizzard was ironic because it was built in response to people not being able to get around during the Blizzard of 1888. Coney Island’s Parachute Jump, also known as Brooklyn’s Eiffel Tower, is lit nightly from dusk until midnight or later. 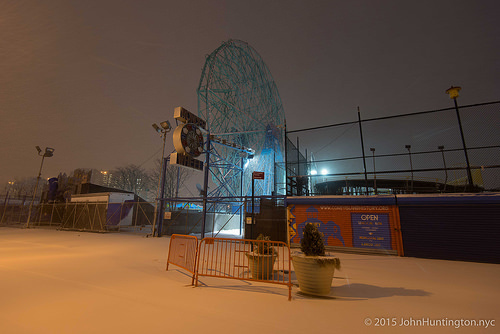 Its 8,000 LEDs, which are said to be visible from Mars and are definitely visible on the Coney Island Cam, remained a beacon during the storm. 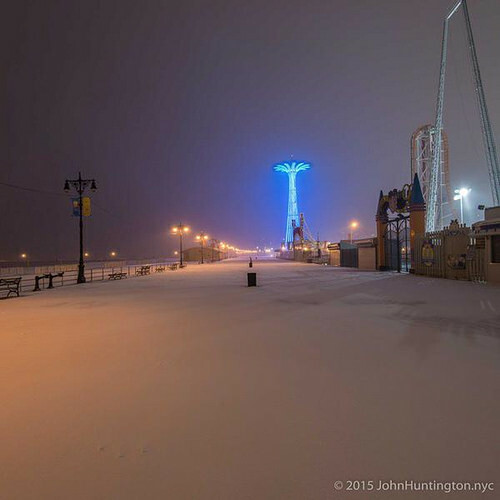 How much snow did he predict for Coney? Some forecasters had begun revising projected snow totals downward.